Uptown Aces and Slot O'Cash are working hard to promote their newest slot game, Henhouse, by offering free spins for one day only to players who play the game on their mobile devices. Henhouse is a brand new slot game that has just been released at both casinos, and they both want players to try out this incredible game. Henhouse is perfect for those who love to play on their mobile phones, too; however, not all gamers are willing to try mobile casino games for whatever reason. To give them a reason to try playing on a mobile platform, Uptown Aces and Slot O'Cash decided to offer 30 free spins for Henhouse. The promotions are a little bit different. For Uptown Aces, the bonus is going good on Monday, September 29. Players will have an entire day to claim the 30 free spins by using the code HENMOBILESPINS. Both new and existing players can make use of the code. For Slot O'Cash, the promotion is good on Tuesday, September 30. Again, it's only valid for a day. 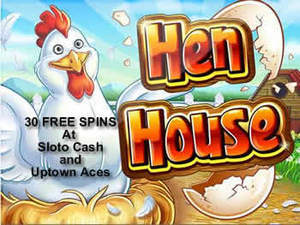 The same code, HENMOBILESPINS, lets players snag 30 free spins just by registering or logging in and playing Henhouse. In addition to the free spins, players who play Henhouse on their mobile device can also get 250% matching bonus on any deposit they make with code HENHOUSE250. This code is valid at both casinos and is good from September 25 to September 30. Note that there are two conditions: there is a 30x playthrough requirement, and players have to deposit at least $25. But the bonuses don't end there. Players at either Uptown Aces or Slot O'Cash can take advantage of a $1,000 free roll. All players have to do is have a RMG account and click on the 1000 Challenge found in the lobby. This free roll is available at the popular T-REX game this month. There's zero buy in. Add-ons are $1.00, while rebuys are $1.50. The prize of $1000 will be available through October 2. Hurry - these offers expire very quickly. Also note that they are not available in every country, so check to see if you can take advantage of them today.